When the legendary Czechoslovak runner Emil Zatopek was at the height of his powers, he won the 5,000 meters, 10,000 meters, and the marathon at the 1952 Helsinki Olympics, which in today’s terms would make him equivalent to a combination of Mo Farah and Eliud Kipchoge. 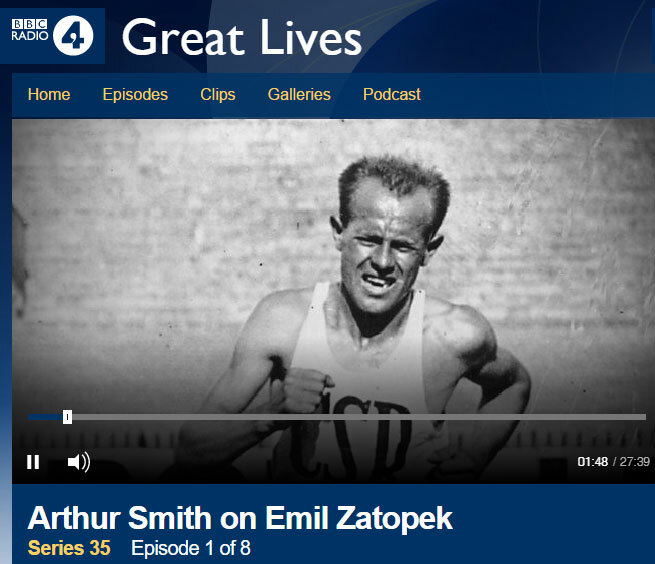 As the leading distance runner of his time - and perhaps of all time, as no-one else has won all three major distance events at the Olympics - Zatopek’s training was suitably Herculean, and he pioneered the use of intense interval training, reputedly doing sessions of 80 or more repeats of 400 meters. He trained in the forests, wearing army boots, so that racing on the track would seem easy by comparison. Zatopek was also known for his courage in racing. Prior to the Helsinki Olympics, he had never run a competitive marathon. Midway through the race, Zatopek, the marathon novice, drew alongside the leader Jim Peters, an Englishman who was the marathon world record holder and favorite to win, and asked: “Is this pace too fast?”. Roberts replied, mischievously: “No, it isn’t fast enough.” Zatopek took Peters at his word and accelerated, passed the Englishman and went on to win the race. Additionally, Zatopek was by all accounts a generous and gregarious soul, who spoke six languages. In 1968 he gave his 10,000-meter gold medal from Helsinki to the Australian runner Ron Clarke, who held multiple world records but through misfortune had missed out on the top honors at both the Tokyo and Mexico Olympics, having collapsed with altitude sickness at the latter. However, also in 1968, a Soviet-led army rolled into Czechoslovakia to crush the Prague Spring, a political reform movement that sought to liberalize the then Warsaw Pact country. Zatopek was a keen supporter of the Prague Spring, and became a prominent figure in the popular protests against the invasion, particularly those that took place around the intruder tanks parked in Wenceslas Square in central Prague. By this stage, Zatopek’s running career was over, but he was still a national hero. The new, hardline regime that was imposed on Prague got its revenge: Zatopek was stripped of his army officer rank and position in the Communist Party, and forced to do a series of menial jobs, said to include street-cleaning and working in a uranium mine. So on my visit to Prague to run the marathon, it was somehow both appropriate and incongruous to find that the technical facilities for the race - the bag-drop, port-a-loos, medical center and post-race refreshments - should also now be in Wenceslas Square, where Zatopek had once remonstrated with Soviet tank crews. That Wenceslas Square is also now largely lined by international retail chains, and is said to be a popular haunt for stag parties, further adds to the incongruity. But Wenceslas Square is also a short walk from Old Town Square, a landmark of Prague’s historic city center and also the site for the marathon start- and finish-line. I had come to Prague from Dubai with two friends, David and Tom, who had been planning for some months to do the race. I had signed up late, partly with the aim of getting a qualifying time to enter next year’s Boston marathon. In the UAE, we are used to races that start very early in the morning, to avoid the heat. So the 9am start time for the Prague run seemed quite relaxed to us. At 8:30 I spotted David and Tom, who had made their way to the start separately from me, in one of the pens and squeezed through the other runners to join them. David took some pre-race shots on his GoPro. The event MC introduced the elite runners - the Prague marathon is categorized by the IAAF as a Gold Label Road Race and attracts a strong elite field - and told us that the temperature was 12 degrees Centigrade, ideal for running. Then, after a slightly underwhelming release of about 20 balloons, we were off, first walking and then trotting towards the start line, and then running on the cobble-stoned streets of the old town. The Prague marathon route follows a series of loops along the Vltava river, which runners cross, on bridges, a total of ten times during the race. An initial 4km circuit goes over the Vltava and into the Mala Strana district that sits below the ninth-century Prague Castle, before returning to the Old Town area via Charles Bridge, also a standout historic site, and then going back out along the river. To start with, David and I ran together. But at about the 3km mark, I noticed that we were running at 4:10 per km pace. I knew that I would hit problems if I continued at that rate, so I slowed to 4:40 per km. The next time I saw David was at about the 16km mark, when we were on opposite sides of the road on one of the out-and-back sections of the route. David waved and called out enthusiastically. He might even have taken a few more shots on the GoPro. He was in front of the 3:15 pace group and running confidently. As I crossed the halfway point in one hour 41 minutes, I congratulated myself on my careful pacing. I was still feeling comfortable, and even began to contemplate the surge that I would put in for the last few kilometers, to get a negative split by running the second half of the race faster than the first. But before long, progress began to get harder. Perhaps those cobbles and bridges - plus a lengthy underpass, which we had been through once and would have to go through again in the final few kilometers of the race - were taking their toll. At about 28km, I saw David again. This time he didn’t call out or wave. There was no sign of the GoPro. And I could only croak a half-hearted salute. As we mortals grappled with the final third of the race, the elites were reaching home. Kenyan Valary Aiyabei was the star of the elite field, winning the women’s race in a new course record of 2:21:57. Ethiopian Gebretsadik Abraha won the men’s race in 2:08:47, after overtaking compatriot Bazu Worku in the final kilometer. Aiyabei had been fourth in the Prague Half Marathon that had taken place just five weeks earlier, in which another Kenyan, Joyciline Jepkosgei, had set a new women’s world record for the half marathon. Jepkosgei’s record eclipsed the one set just two months earlier in Ras Al Khaimah by Peres Jepchirchir. Jepkosgei was third in the Ras Al Khaimah race, which I wrote about in an earlier report for Never Stop Running. The trio from Dubai had a good day in Prague too. David finished in 3:14, a personal best by four minutes. Tom finished in 3:44, meeting his target of getting a sub-3:45 time. And I finished in 3:26, about five minutes slower than I had hoped, but probably still good enough to get into Boston next year, based on the standard required for my new age group. Event website: Details about the Prague Marathon, as well as about other running events that are put on by the organizers, RunCzech, can be found at: www.runczech.com. Date: The 2017 marathon was on May 7th. The date for the 2018 race has not been announced yet. Will the shoes make the man?